Much of what I know about my great-great-great-grandfather, William Jones Bowling, is thanks largely to my distant cousin, Joe Bowling, who descends from an uncle of William Jones Bowling’s. Joe sent me a copy of William Jones Bowling’s Civil War records, consisting of his record as a prisoner of war and his application for a pension. William Jones Bowling was born January 20, 1840 in Haywood County, Tennessee. W.J. Bowling himself gives this information on his pension application. He enlisted in the Confederate States Army in August 1861, according to his pension application. He was captured on March 21, 1864 in Bolivar, Hardeman County, Tennessee (the county bordering his birth county of Haywood to the south). According to his POW records, he “gave himself up.” He appears to have been sent first to Alton Military Prison. He appears on a roll of prisoners of war which indicates he was received at Alton on April 21, 1864. He was transferred to Camp Douglas, Illinois (Chicago) on August 23, 1864 and appears on a roll of prisoners of war received at Camp Douglas on August 24, 1864. 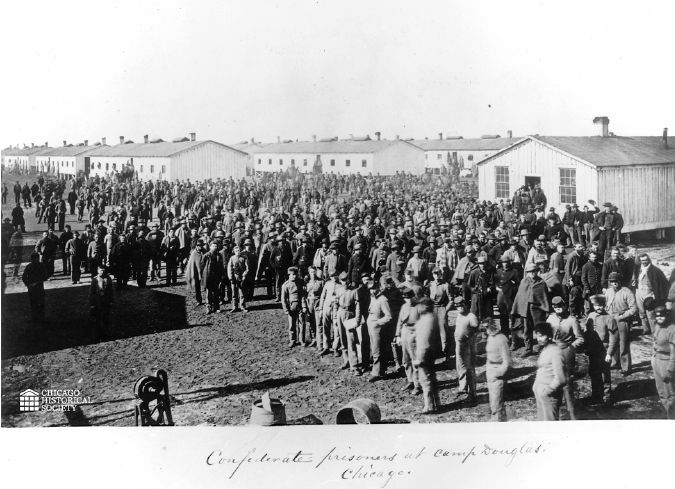 Camp Douglas has been considered the Andersonville of the North — described in a History Channel documentary as “80 acres of hell.” The photograph below is dated 1863, so I know that my ggg-grandfather is not one of the many faces in the sea of prisoners, but I find the photograph poignant nonetheless. You can fully explore this photograph, including zooming in to see close detail, at the Encyclopedia of Chicago. Claim to have been loyal. Enlisted in the Rebel Army to avoid conscription and desire to take oath of allegiance and become loyal citizen. He apparently did take this oath of allegiance and was discharged on May 16, 1865. His discharge lists his place of residence as “Hardinmond Co., Tenn.,” which I believe to be a reference to Hardeman County. The 1860 census corroborates this evidence, citing Bolivar, Hardeman County, Tennessee as the residence of W. J. Bowling. William Jones Bowling’s POW records all list him as a Private in Company H of the 15th Regiment, Tennessee Infantry. Other records, including his pension application, refer to him as a First Sergeant in Company K of the Fourth Confederate Infantry (1st Alabama, Tennessee, and Mississippi). Which is it? Given the volatility and frequent reorganization during the war, it could be both. I am not as troubled by the inconsistency regarding organization as I am the inconsistency regarding his rank, especially because my cousin Joe is so thorough in his research, and I don’t think he made a mistake. According to my cousin Joe, William Jones Bowling decided to become a minister while he was imprisoned. It makes sense that a man living in such desperate conditions might turn to the Bible and religion for comfort. In an upcoming post, I will share William Jones Bowling’s application for a Confederate pension, along with the wealth of information gleaned from it. Thanks for this informative article. My great-grandfather and his brother were captured at the battle of Franklin (TN) in December 1864 and taken to Camp Douglas. They weren’t released until August, 1865, and walked back home to Georgia. Your article and the links you’ve included will help me learn more about the Camp and my ancestors’ experience there. Is your ggg grandfather the son of Jordan Efferson Bowling? I read your blog and I didn’t have this William Bowling in my tree but yet I am an ancestor of William Bowling (1789-1860). My ggg grandfather is Jarrett Wesley Bowling (1808-1879). I enjoy reading your blogs about our family. Sorry I mean gggg grandfather is Jarrett Wesley Bowling, my ggg grandfather is Wilbur Henderson Bowling (1846-1902). My goodness this can get confusing. I just started my search and I find all of this fascinating. Thats all for now. I like your approach to genealogy. Very nice. I was born in Montgomery Co., NC and go back into many of the first settlers there. Clarks for one as you do. I let others work these lines and focus on Bollings as I have Bollings several times. A John Bolling m. Mary bc 1729 lived on the Forks of the Little River. I have him by his daughter m. Hurt. I worked this line a long time and still don’t have all his children found. Can your bolling be of this line? In Randolph Co., just across from Montgomery to the north, a Benjamin Bolling II, 1754, m. Sarah Hancock lived and I have him as well and other Bollings. Not the same line of Bollings. Most of the early work done on these families is disputed and DNA is a disaster as well. I have to wonder if you have others from old Anson or Rowan Co., NC?